By Judy Haiven, a member of Independent Jewish Voices- Canada. She teaches at Saint Mary’s University and is also a member of Solidarity Halifax. Originally published at the Halifax Media Coop. 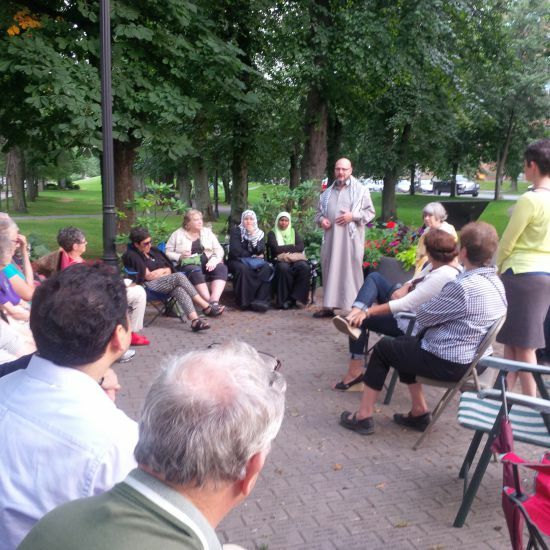 On the second last day of Ramadan, about thirty Muslims, Jews and their friends gathered in Victoria Park an hour before nightfall to break the fast. Traditionally, Muslims break the daily fast during Ramadan with a meal called Iftar. Iftar is held right after evening prayers. In this case, Muslim participants first prayed, and then with Jewish and non-Jewish friends ate dates and sweet cakes and drank water to symbolize the breaking of the fast. On July 24, a United Nations’ school was destroyed by an Israeli missile which killed 15 Gazan civilians and injured 200 – the school was being used as a shelter for hundreds of Gazan refugees. Tens of thousands of Gazans have been forced to leave their homes and have nowhere safe to go as the border crossings with Israel and Egypt are closed. There is no way out by sea, as Israeli naval gunboats patrol the coast and lob missiles to the shore. This is how 4 Gaza boys aged 9-10, from the Bakr family, were killed when they played soccer on the beach one week ago. Israel has destroyed 46 schools, 56 mosques and 7 hospitals. Often civilians seeking safety inside were killed. The Israeli Broacast Authority (IBA) has refused to air a spot in which the names of Gazan children killed during ‘Operation Protective Edge’ were read out. This, despite almost 300,000 people reading the names in a post shared widely on the internet. Hundreds of Israeli-Arabs, who themselves are citizens of Israel, have been arrested, threatened and beaten — notably scores of children. This is a method of silencing dissent, and stopping protests in Israel.